Vegan Calamari Recipe - Gutom Na! Posted on Monday, March 6th, 2017 at 3:05 pm. Pour enough oil into a deep frying pan or pot until you have about 2 inches of oil. Heat over high heat. If you have a frying thermometer, aim for 365 degrees Fahrenheit. If you don’t have a thermometer, test a small amount of mushroom and see if it bubbles right away without boiling. If it does, it’s ready. If the oil is starting to smoke before putting the mushroom, your oil has become too hot. Lower heat until smoke disappears. Using your hands or a vegetable peeler, strip the mushroom into thin layers. If you want to do the traditional round shape, thinly slice the mushroom horizontally into rounds and cut out the core. In batches, dunk the mushroom in milk then coat in flour mixture. Fry in oil for 3 minutes. Repeat steps for the rest of the batch. Make sure you don’t overcrowd the pan or pot when frying. Place calamari on paper towels to drain excess oil. Sprinkle sea salt all over. Serve immediately. Serve with lemon wedges, parsley, and spiced vinegar (optional). 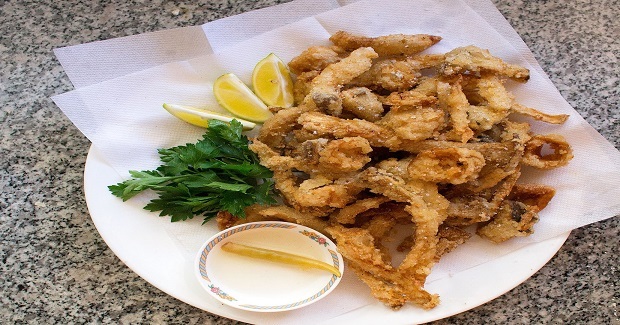 To make the American calamari version, squeeze lemon juice over fried calamari and serve with marinara or tomato sauce on the side.